On April 19, the Spring Canton Fair of 2016 was successfully concluded at Pazhou Exhibition Hall of Guangzhou. In the spring this year, the Canton Fair was bustling and crowded with visitors as usual. Our new products exhibited have also received extensive praise. The Canton Fair is a global exchange fair. We have exhibited our latest products. This time, we have exhibited new products including newly released product B1, A1, L73, L81 and L91 series of LCD TV; 31S, 81S, 91S, 01S and 02S series of monitors, etc. 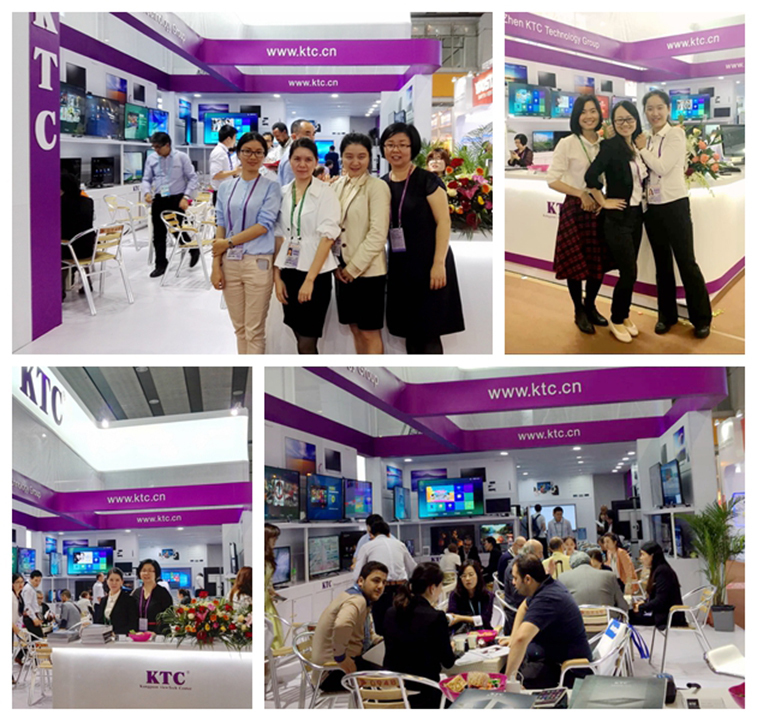 This time, we adopted a super-large exhibition stand to display our technological products, which fully showcased our innovation and manufacture strength. Among our product series, the production process of 4K LCD TV and monitor has increasingly approached perfection. The new product released this time, B1 LCD TV is more advanced and exquisite on the basis of slimness and UHD technology of A1. B1 series adopt a decorative metal frame. Its opencell E-LED has a higher cost advantage, graceful lines and an elegant appearance, which can be said to be an upgrade of A1 series whether in cost performance or in functions. The U3201S and U4391S monitors displayed this time adopt a 4K display screen and carry a RTD2796 main-board solution, which has further enhanced the performance of the whole machine and highlight its life-like display effect. Besides, we have exhibited 02S series monitors, whose narrow edge and super-thin body is praised by the customers. And the customers also appreciate its practical innovation such as adjustable height of the base, anticlockwise rotation by 90°, and rotation by 45° respectively leftwards and rightwards. The warm and elegant booth arrangement, the orderly exhibition of our products and the simple and liberal booth layout set off each other, manifesting a high-end modernity. The Canton Fair is a key moment to manifest the market appeal of an enterprise. Each year, we make an appointment with both new and old clients here, who have come here for visiting or negotiation. Currently the market competition is increasingly fierce. As an exchange event for technological innovation, new product release and exchange of industrial information, the Canton Fair is a stage for the enterprises to keep innovating and supplying better, people-friendly products that better meet the demands of customers. Through this exhibition, it fully proves our strong research and development strength and market appeal. Meanwhile, we shall also grasp the market direction, optimize our costs and forge ahead against difficulties.